Anthrax is an infection that is caused by the bacterium Bacillus anthracis . Several different types of anthrax infection can be caused by the bacterium. Entry of bacteria through a skin wound can produce a skin infection known as cutaneous anthrax. Microorganisms can also contaminate food or water. Ingestion of the contaminated food or water produces gastrointestinal anthrax. The most serious type of anthrax results from the inhalation of the spore form of the bacterium. Inhalation anthrax has a high mortality rate. In the 1990s, United States military personnel in the Persian Gulf region faced the possibility of retaliatory strikes using biological weapons, in particular anthrax. Domestically, the use of Bacillus anthracis spores by terrorists is a reality. Although not directly related by evidence to the September 11, 2001, terrorist attacks on the World Trade Center and Pentagon in the United States, letters containing powdered anthrax bacteria and spores were sent to a number of politicians, media personalities, and U.S. citizens. Even more ominously, the terrorists responsible for the September 11 attacks had attempted to procure a small crop dusting aircraft. Such an aircraft could potentially disperse several hundred kilograms of anthrax spores upwind of a major urban center in only a few hours. One scenario developed by scientists for Washington, D.C. indicated that up to three million people could be sickened or killed by such an attack. For some years, military personnel and others at risk for anthrax exposure (i.e., researchers and those handling animals) have received an anthrax vaccine. For example, U.S. military personnel were vaccinated in 1990, during the Gulf War, and again prior to another response in that region in 1998. The increasing risk and incidence of anthrax exposure, however, have made the development of different and safer anthrax vaccines a priority. The use of anthrax against civilians, and the ominous scenarios of anthrax spores released in the ventilation systems of office buildings and over large urban centers, have created the possibility that millions of people would potentially require vaccination. As well, large stockpiles of anthrax vaccine (as well as antibiotics) would be required, in anticipation of future outbreaks. Current anthrax vaccine. The anthrax vaccine now in use dates back to the time of Louis Pasteur, in the mid-nineteenth century. Pasteur noted that the injection of animals with an attenuated type of Bacillus anthracis protected the animals from contracting anthrax. An attenuated strain of bacteria is one that can be capable of growth, but which does not cause disease. The body's immune system will react to the bacteria, and produce antibodies that will protect the animal or person from future exposure to the disease-causing bacteria. A modification of this attenuated vaccine developed in the late 1930s still serves as the anthrax vaccine given to animals. In the late nineteenth century, the use of live bacteria as vaccines was still too dangerous for humans. In the early years of the twentieth century, researchers began exploring the use of components of the anthrax bacterium as a protective measure. In 1954, a product was developed that consisted of soluble material called protective antigen, which is released by Bacillus anthracis , and which can be precipitated out of solution—along with two other cell components called the lethal factor and the edema factor—by the use of aluminum potassium sulfate (alum). Filtering the suspension captures the antigenic compounds. 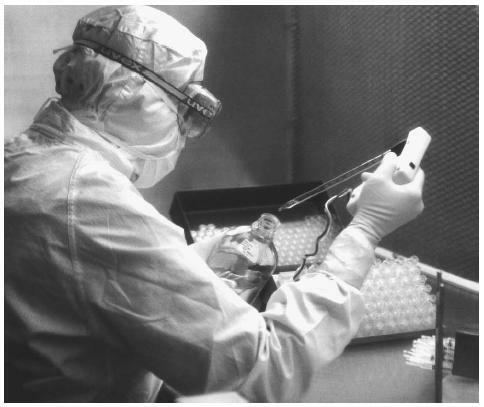 A technician works in a clean room filling anthrax vaccine vials at a Spokane, Washington, laboratory in 2002.
growth media that was free of protein (that could also stimulate an immune reaction), and the use of aluminum hydroxide instead of alum had produced a superior vaccine. The improved product, anthrax vaccine adsorbed (AVA), was approved for use in the United States in 1965. AVA remains the only licensed vaccine in the United States as of early 2003. Protective antigen, lethal factor, and edema factor. The protective antigen is a protein that can insert into the membrane of a host cell to create a hole, or pore, through the membrane. The pore then functions as a portal to allow the other two components to get inside of the host cell. The lethal factor is a type of enzyme classified as a zinc protease. The enzyme attacks and breaks host proteins into smaller and nonfunctional pieces. Destroying host cell proteins is lethal to the host cell, hence the factor's name. Edema factor is a toxin. The destruction of the host cells allows this toxin to enter the bloodstream, where it can kill cells of the immune system. Disabling the host's immune response allows the bacteria and the toxin to spread throughout the body. Side effects of the anthrax vaccine. Like some other vaccines, AVA can cause side effects, which can, in rare instances, be life threatening or fatal. Data regarding adverse events are available from the Vaccine Event Reporting System (a U.S. vaccine safety surveillance program that is under the direction of the Food and Drug Administration and the Centers for Disease Control and Prevention). From January 1, 1990 through August 31, 2000, 1,859,000 doses of anthrax vaccine were administered in the United States. The number of adverse events was 1,544 (e.g. sensitivity at injection site, headache, muscle ache) with 76 of these being serious (e.g., heart failure, blood infection). Other than reaction at the site of injection, it is still not clear whether the other maladies were directly due to the vaccine. Nonetheless, the number of adverse reactions were small. Echoing this data, a report released in March 2002 by the U.S. National Academy of Sciences Institute of Medicine concluded that AVA is "acceptably safe." However, the report noted the lack of data on the long-term effects of the vaccine. Studies conducted by the Department of Defense on vaccinated military personnel found that most adverse events were minor, were localized to the site of injection, and cleared up within a few days. The involvement of anthrax vaccine to the development of a multi-symptom debilitating syndrome reported in military personnel deployed in the Persian Gulf conflicts ("Gulf War Syndrome") was investigated by the Centers for Disease Control and Prevention. No scientific evidence of an association was found. However, studies conducted on Canadian and British soldiers stationed in the Gulf and in Bosnia (where anthrax deployment was also a threat) were not as conclusive. Limitations of the anthrax vaccine. While the risks posed by AVA may not be pronounced, the vaccine is problematic from the standpoints of supply and quality of the product. In addition to aluminum, the vaccine contains benzethonium chloride as a preservative and formaldehyde to keep the vaccine mixture stable upon storage. Despite regulatory examinations that have confirmed the safety of the vaccine, there continues to be debate as to the possible long-term harm from the presence of these chemicals. Another problem concerns the frequency of vaccination that is required to establish immunity. Primary vaccination requires three injections at 0, 2, and 4 weeks, followed by three booster injections at 6, 12, and 18 months. To maintain the immunity, annual injections are recommended. Such a frequent regimen of injections is inconvenient and requires almost two years to establish peak protection. The vaccine is not designed to confer rapid immunity. The nature of the vaccine's preparation—collection of material extruded by the bacteria—makes the vaccine crude in terms of its exact composition and proportion of the various components. This unpredictability, and the scarcity of the vaccine have limited the wide-spread availability of AVA. The vaccine is currently manufactured at a single facility in the U.S., and only in sufficient quantity for use by those at risk of infection, such as combat personnel and researchers. Advisory Committee on Immunization Practices. "Recommendations of the Advisory Committee on Immunization Practices: Use of Anthrax Vaccine in the United States." Morbidity and Mortality Weekly Report no. 49(2000): 1–20. Bradley, K. A., J. Mogridge, M. Mourey, et al. "Identification of the Cellular Receptor for Anthrax Toxin." Nature no. 414 (2001): 225–229. Friedlander, A. M. "Tackling Anthrax." Nature no. 414 (2001): 160–161. Joellenbeck, L. M., L. L. Zwanziger, J. S. Durch, et al. The Anthrax Vaccine: Is It Safe? Does It Work? Washington, DC: National Academies Press, 2002.